The image of Murtaza sporting a makeshift Messi jersey, made of a blue and white striped plastic bag and with Messi's name and famous number 10 written carefully on the back in felt-tip pen, flooded media and social networks in 2016. The fear felt by the Ahmadi family was ratcheted up when they learned that the Taliban were searching for Murtaza by name. "[They] said if they capture him, they will cut him into pieces," Shafiqa said, her eyes horrified. Shafiqa said she hid her son's face with a scarf to prevent him from being recognised as they fled. Among their belongings left behind are the football and jersey signed by Messi. They are among the more than 300,000 Afghans, 58% of whom are under the age of 18, who have fled their homes due to violence since the beginning of this year alone, according to the most recent tally by the UN's agency for humanitarian affairs. 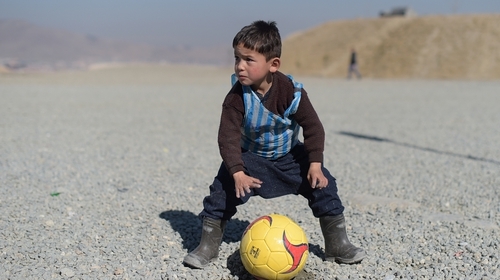 Homayoun, Murtaza's eldest brother who made him his plastic jersey, says that even in Kabul he is afraid. "We are worried something bad will happen if they know who Murtaza is," he said.